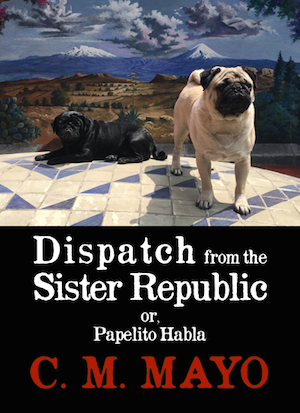 A bouquet of bienvenidos for new readers of this blog in 2018. And as you long-time readers know, I post here at "Madam Mayo" blog on Mondays. 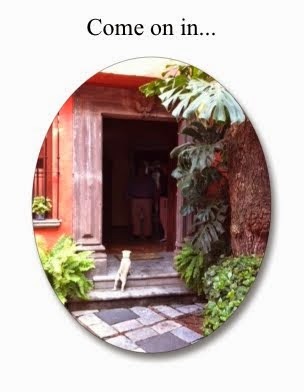 For 2018, Monday is still the magic day, and every fourth Monday of the month will feature either a post on cyberflanerie or a Q & A with another writer, poet, and/or literary translator. 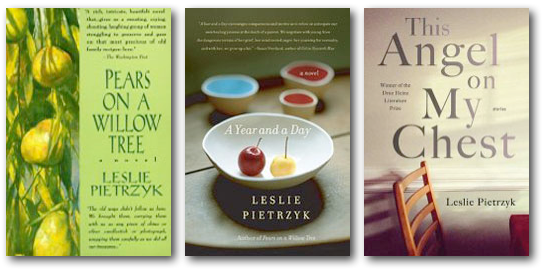 Pietrzyk is also the author of This Angel on My Chest, winner of the Drue Heinz Prize for Short Fiction; and the novels A Year and a Day and Pears on a Willow Tree. C.M. 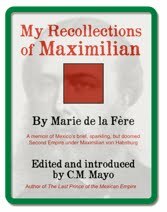 MAYO: You have been a consistently productive literary writer for many years. How has the digital revolution affected your writing? Specifically, has it become more challenging to stay focused with the siren calls of email, texting, blogs, online newspapers and magazines, Facebook, Twitter, and such? If so, do you have some tips and tricks you might be able to share? LELSIE PIETRZYK: Oh, yes, yes, yes…I’m a sucker for that siren song of the online world. I’m not sure I’ve come up with the answer for maintaining focus, but sometimes I’ll try setting timers (say, no Facebook until two hours have passed) or working late at night (fewer people online to chat with). I don’t answer email on the weekends. But what works better for me (unless I’m kidding myself), is that I’ve become more open to working WITH social media and the wide world of Google available while I’m writing. Why knock myself out trying to imagine the color of nail polishes in 1982 when I can simply Google for an answer and see an array before me? Why berate myself for dipping into Facebook for five minutes? Why not just accept that distractions are part of our world now and try to retrain myself to write deeply amidst them? LP: For many years I was in an incredible, high-level writing group of 6 women who shared novels-in-progress…dear Madam Mayo belonged to this group! I think I learned how to write a novel from these monthly meetings. When the group dissipated after 10 years, I was—honestly—tired of having critical voices in my head. Plus, I was in the beginning phases of putting together a story collection that was linked unconventionally, by incident (in each story, a young husband dies suddenly; the book became This Angel on My Chest). Because what I was doing was so difficult, and because I didn’t know how on earth I was going to make this premise work, and because I didn’t want to hear one word about my flailing, I decided that it was time for a different kind of group. I started my neighborhood prompt writing group, and we meet once a month and write for 30 minutes to open-ended, one-word prompts. We can read out loud or not, and there are no critiques, only admiration. 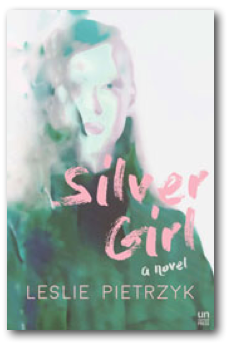 We’ve been meeting for more than 5 years now, and chunks of Silver Girl emerged from these meetings. CM: Did you experience any blocks while writing this novel, and if so, how did you break through them? LP: My biggest block actually came right at the beginning. I had been writing character sketches and scenes in my prompt group for at least eighteen months before I started the book in earnest, so I had all this material. My two college girl characters were dark and edgy and complicated, and I’d teased out a ton of fascinating history to their relationship. When I finally finished This Angel on My Chest I thought it would be a simple glide right into the new book…but I realized immediately that my complicated, interesting characters had no plot! It was a humbling moment. CM: Back to a digital question. At what point, if any, were you working on paper for this novel? Was working on paper necessary for you, or problematic? LP: I never thought I’d say this, but paper was very important! I’m usually all-computer-all-the-time, but I’ve found that writing to prompts on paper feels freeing and takes my mind to riskier, more interesting places. 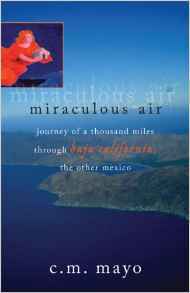 So I wrote about Jess and the unnamed narrator many, many times across several little notebooks. The problematic parts came in trying to locate scenes I was sure I’d remembered writing, and when I had to type into the computer, a task I despise. Perhaps even more problematic is the constant fear that I’ll lose one of my notebooks to carelessness or fire before I transcribe its contents! CM: Do you keep in active touch with your readers? If so, do you prefer hearing from them by email, sending a newsletter, a conversation via social media, or some combination? *CM: I too left our writing group, and for similar reasons. 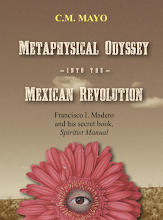 (I was about half way into an epic and epically complex historical novel, and after I got rolling with that, receiving critiques from other writers who were, of necessity, reading 30 pages out of context, was turning into more trouble than it was worth to me-- and, to further complicate matters, I was transitioning to living in Mexico City again.) Nontheless I remain immensely grateful for members' critiques of the beginning drafts of this novel, as well as of several other short stories and literary essays. And I miss the comraderie of those meetings with such excellent friends and esteemed colleagues. Those years for me personally, and for my writing, were a rare blessing. **CM: For anyone interested in writing and publishing literary fiction, Leslie Pietrzyk's Work-in-Progress blog is a read well worth your while. > Your comments are ever and always welcome. Write to me here. As announced in my last post of last year, in 2018 I will continue to post on Mondays, with the first and third Mondays of the month devoted to posts related to my own work and/or work-in-progress. How I wish I could be posting about a new podcast or excerpt from my book-in-progress, but this finds me still mired in the mudslide of tasks post-household move #2. 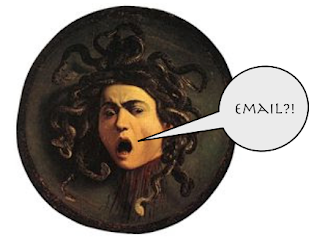 One of the tasks in the mudslide is catching up on email. I still stand by my 10-point protocol; however, I now consider that post as less a celebration than a handy reminder to myself to take my own advice as life's Black Swan-esque episodes may demand. 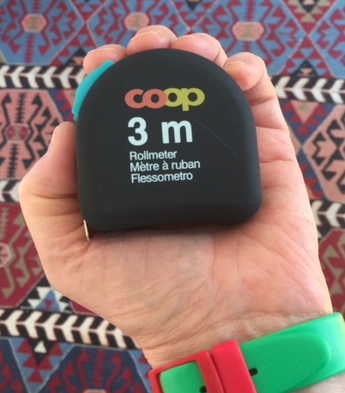 Over the past months, further refinements with my email process, such as using a Zassenhaus timer helped, as did insights from further noodling... But moving house being the utter chaos that moving house is, the email backlog accumulated up to, understandably, one heckuva Himalaya. Now it's already more a Sierra Madre; daunting, yes, but with relatively more sky. But of course I'm aiming for a wide sky over low rolling hills... And it's getting rather tiresome to be starting almost every single email with an apology for the delay. #1. I now use the Mr. Stopwatch app for batching email. This not just another stopwatch app; I can click on the option to have each elapsed minute loudly announced by, I presume, the app designer, which is so perfectly annoyingly perfect. What do I mean, perfectly annoyingly perfect? One of the problems I've had is, ironically, spending too much time on email and so ending up dithering around in a Ludic loop. I find I can work down more of my email backlog when I process it in batches of say, 20 minutes-- and the trick is to actually stop after 20 minutes. 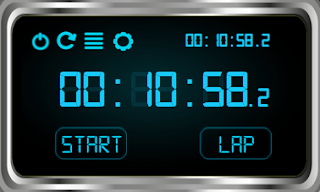 With the audio on-the-minute option, Mr. Stopwatch is so annoying -- which is perfect for me!-- that I usually yearn to stop after 10 - 15 minutes, which is even better. For email, Mr. Stopwatch beats the Zassenhaus. Anyway, I forgot to pack my Zassenhaus. #2. Whenever apt, and if I feel so moved, I send a postcard instead. Inspired by Karen Benke's Write Back Soon! I have begun keeping a batch of postcards handy near my laptop. 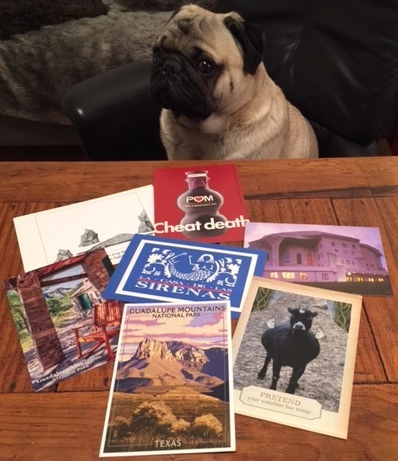 I myself am charmed to receive postcards (I mean personal, not junk mail, of course), so I would assume that some of my correspondents might feel the same way-- and so, with a postcard I can say hello to friends and family without adding another email to their personal Himalayas or Alps, or speedbumpitos, or what have you. P.S. Nope, no Whatsapp, no FB, and I have largely abandoned Twitter. And I just might start typing my postcard messages on a typewriter! But I have to get another typewriter. For reasons too ridiculous to elaborate on here, I had to leave my beautiful 1961 Hermes 3000 on the other side of the ocean. All this said, I sincerely do appreciate email. "Dear Mother, am feeling fine, hard s a rock and brown as an Indian... "
Labels: email, email for writers, Karen Benke, postcards. email tips, productivity, reminder to take my own advice, Write Back Soon! As announced in my last post of last year, in 2018 I will continue to post on Mondays, with the second Monday of the month dedicated to my writing workshop students and anyone else interested in creative writing. 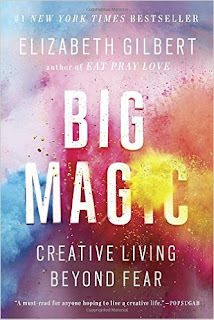 New on the frequently updated list: Elizabeth Gilbert's Big Magic: Creative Living Beyond Fear. I listened to the audio edition, read by the author, and it was such a trove of wisdom, I listened to it again. 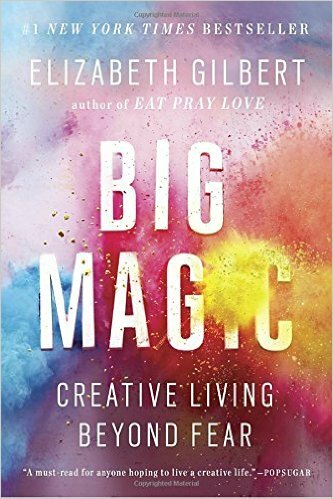 > Visit the main "Recommended Reading: Creative Process" page here. 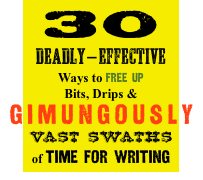 Updates on ye olde article "Ten Tips for Getting the Most Out of Your Writing Workshop." 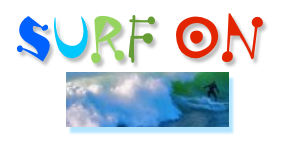 > Visit the main "Tips & Tools" page here. 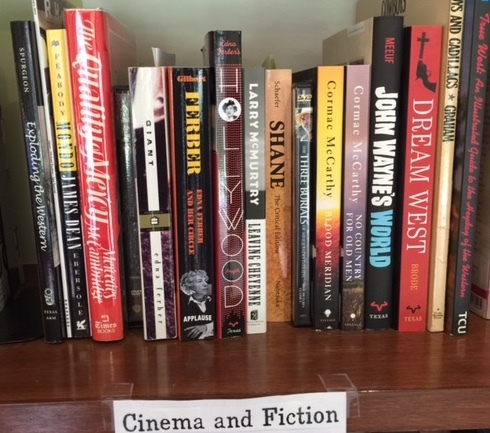 Several updates on ye olde article, "Out of the Forest of Noise: On Publishing the Literary Short Story," including new links to a treasure of a resource, Clifford Garstang's Perpetual Folly Literary Magazine Rankings for fiction, nonfiction, and poetry. Thank you, Clifford! 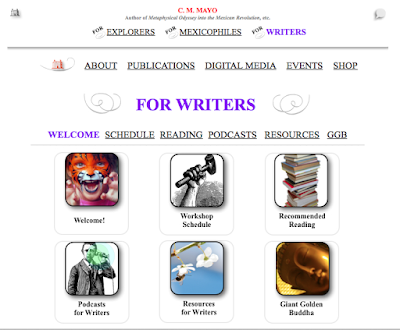 > Visit the main "On Publishing" page here. February 12 "Popol Vuh: Seven Random Bits"
~And they remembered what had been said about the East. What can you write in five minutes that incorporates all of these? Alternatively, pull a random book from your own shelves for your own random seven bits, and do five minutes of writing incorporating those. 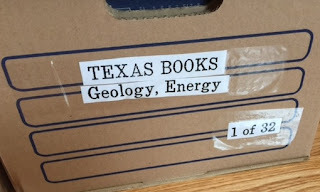 [ The Texas Bibliothek, Ready to Ship. Yes, it is big. Yes, I devour books like a ravenous owl. Yes, this is my process. File this post under Future Reminder to Take My Own Advice, and if some or all of these ideas also work for you, gentle reader, verily I say unto you: Wunderbar! 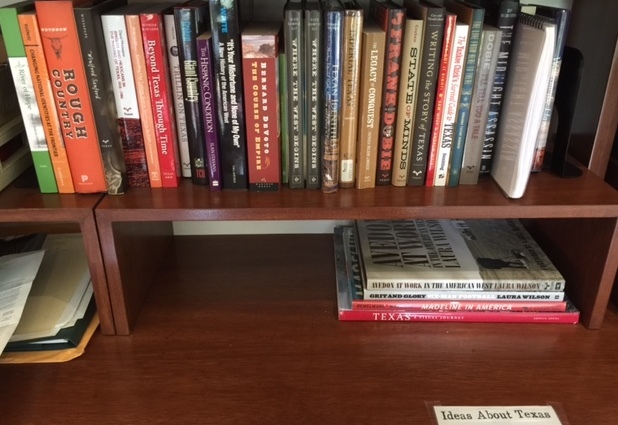 Late last September, having finally rearranged and set up my working library in my new office in Mexico City-- the work in question being a book on Far West Texas-- I had to pack it all back up again and ship it across the Atlantic. (Why? Well, that's a novel I'm not going to write, both literally and figuratively). Now that I've got my Texas books resettled on their second set of new shelves in less than six months, I'm ready to take on 2018! But whew, I've got biceps after this job for a Hercules. 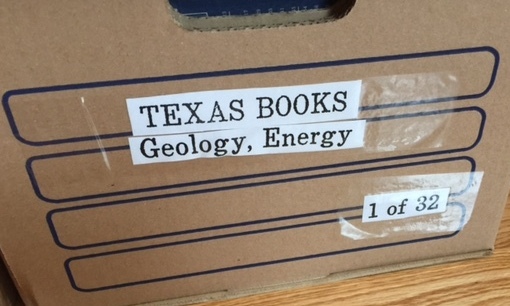 The thirty-eight boxes of books comprising what I now call the Texas Bibliothek-- I have landed in German-speaking Switzerland-- arrived in mid-January. And a couple weeks later, every tome and paperback and pamphlet and back-issue of Cenizo Journal is in place, and I can carry my bike over head! I could scoop up and toss dessicated Christmas trees, small donkeys and their Schmutzlis out windows, too, should I take a notion! 1. Organize the books by topic-- not as a librarian would recommend, but as your working writer's mind finds most apt. After all, you're the one who will be using these books, not the general public. And even in a fairly substantial working library, such as this one, there are not enough books to justify the bothernation of cataloging and labeling each and every title. 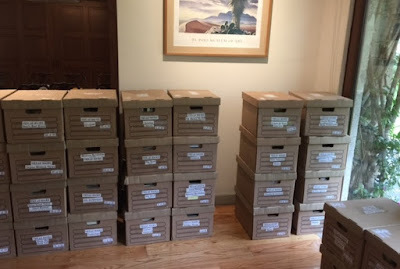 If you have more than 50 books and if you do not organize them in some reasonably reasonable way, why don't you just open your front door and let your dogs wander out and then you can go looking for them on the freeway at four a.m., that might be more fun! 2. If any category has more than 30-40 books, create a new subcategory. Because trying to keep books in alphabetic order, whether by author or by title, makes me feel dehydrated, RRRRRR. 3. 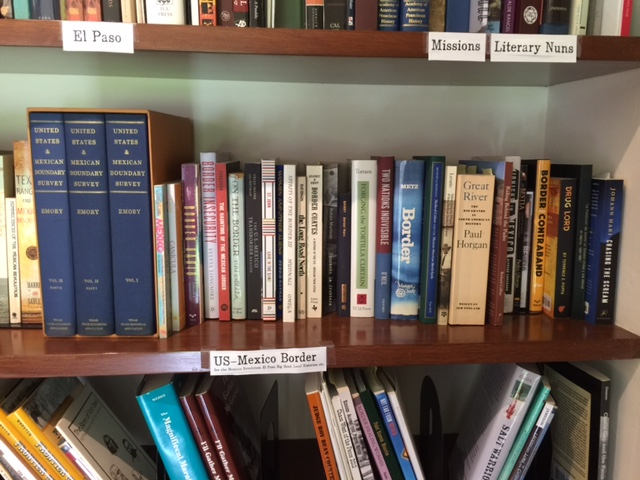 Label categories of books with large, easy-to-read lettering. Funny how book designers always have such unique ideas about colors and font sizes and typefaces.... In other words, I don't want to have to look at the visual clutter of those spines to try to figure out what this bunch is about; I let that BIG FAT LABEL tell me. If you do not want to make labels, why don't you peel the labels off all the jars and cans in your pantry, mix 'em up, and then try to find which one is the dog food and which one the canned pumpkin? That would be a mile more hilarious. 4. When moving, before touching anything, take photos of the whole shebang. 5. Then, before even touching those books, take a tape measure and write down the inches of shelf space required for each and every category. I realize this may sound very OCD. The main thing is, you want to be certain you actually have the bookshelf space you need plus ample wiggle room for each category before you start packing-- and then double check the available bookshelf space again before you start unpacking. And never, ever let anyone else pack them. Sounds obvious. Alas, for me, three moves ago, it was not. 6. 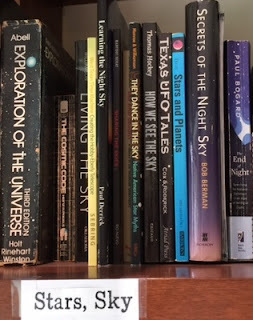 Save those neatly made shelf labels to reattach to the new shelves, and also label-- with mammoth, easy-to-read fonts-- each and every box. 7. Number each box, e.g., 1 of 32; 2 of 32, etc. These can be cross-referenced with the master list of categories, which has the measurements. 8. Don't be stingy with boxes!! For moving books I prefer the so-called banker's boxes with punch-out holes for handles. Banker's boxes are large enough to take a heaping helping of books, and the handles make them easy to carry, however the weight of a book-filled banker's box remains within the range of what I, a 50-something female whose daily mainly workout consists of walking two pugs, and, la-de-da, whatever biking and yoga, can easily haul up or down a staircase. Yes, you could snag a batch of free boxes at the grocery store, and yes, you probably could, as I certainly could, lift bigger boxes with double the number of books in them-- and most men can haul a stack of two or even three bigger boxes at a time. However, whatever the upper-body strength you have and shape you are in, when you are moving house, unless you for some reason enjoy showering hundreds of dollars on, say, your chiropractor's vacation home, lifting huge, ultra-heavy, and unwieldy boxes is penny wise and dollar dumb. Ox dumb. Goodie for me, I learned this lesson three moves ago, and I had an excellent chiropractor. 9. Take photos of the boxes, labels included. Because you never know! Seems I have good moving juju. Knock on wood for next time! P.S. History nerds podcast alert! 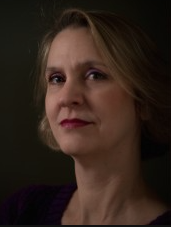 Check out Liz Covart's Ben Franklin's World. Wish me luck, gentle reader. I aim to finish my book on Far West Texas this year. By the way, I host an associated 24 podcast series, "Marfa Mondays," which is woefully behind schedule because of these moves, but soon to resume. I invite you to listen in anytime to the 20 podcasts posted so far. P.S. Using the free blogger platform, I also maintain an online working library of out-of-copyright (now in the public domain, mainly linked to archive.org) Texas books-- books which I could not or did not want to attempt to purchase but would like to be able to consult at my leisure. 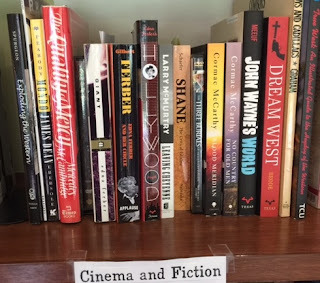 It includes a number of titles that might appear bizarrely out of place (one is on Massachusetts, for example)-- but after all, this is not for the general public, but a working library in service of my book in-progress. I mention this because perhaps you might find it of use to create such an online library for your own purposes. I make no claims for its usefulness to anyone else. P.P.S. For those wondering, what is my take on ebooks? First of all, I delightedly sell them! And yes, I have bought some, and as far as the Texas book research goes, when I need a book urgently and/or the paper edition is unavailable or expensive, I have been known to download a Kindle or four-- or, as above-mentioned, download out-of-copyright books for free from www.archive.org and similar sites. I appreciate that convenience, and also the ease with which I can search within a text for a word or phrase. Nonetheless, on balance, I find ebooks decidedly inferior to paper. Morever, I doubt that my electronic libraries will outlive me in any meaningful way, while I expect that my working libraries of hardcovers and paperbacks, including some rare editions, may serve other researchers well beyond the horizon of my lifetime. Fifth Monday, when applicable: Whatever strikes my gong.